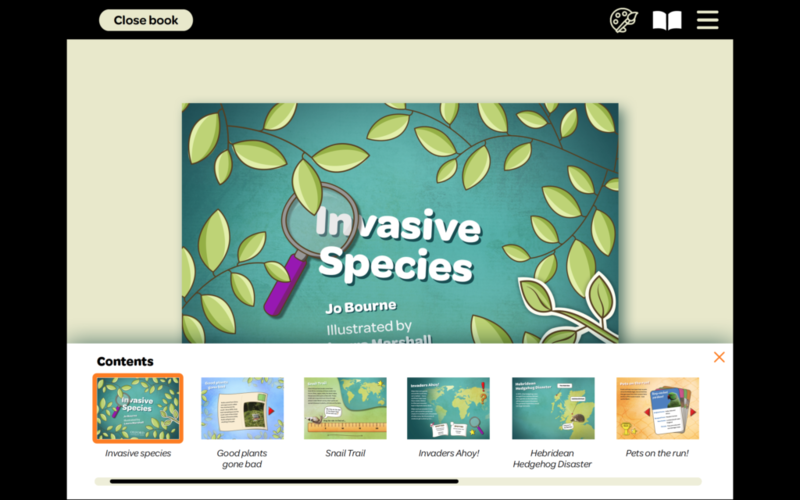 An extract from Laura Marshall's response to the brief Oxford University Press gave our students to redesign their Invasive Species print title as an interactive ebook. This spring term, our Graphic Communication finalists collaborated with Oxford University Press (OUP) on a digital brief for their Oxford Reading Buddies platform. Students taking our new Advanced Typography optional module were asked to redesign OUP’s Invasive Species title for young readers. Working on a digital brief for young readers gave our students an opportunity to bring together their typographic, visualisation and interactive skills in a way that really embraced the user-centred design for reading thinking that underpins our programmes. OUP’s brief emphasised accessibility requirements and our students were able to really engage with a range of inclusive design considerations that went beyond only thinking about compliance to really engaging with supporting different learning styles.